Maureen Butcher, 66, of Titusville, died Sunday, (10/28) at Parrish Medical Center. A native of Oakland, California she was raised in San Leandro, California. She came to Titusville in February 1987 from Amarillo, Texas. Maureen was a very caring and spiritual person who was always looking out for others. She worked in the Public School system in the cafeteria and expanded her education and honed her skills until she became a baker. Always creative and working with her hands she established a business sewing and knitting various items including slippers, animal sweaters, and various other items. She also created many things using beads which were sought after by many. She enjoyed traveling and had seen many parts of the United States. Survivors include her husband: Jeff; sister: Mickie (Jimmy) Utley of San Leandro, CA; two nephews: Garrick and Robert Utley; and a grandniece: Yesenia Utley and grandnephew: R.J. Utley. A service will be scheduled at Newcomer Cremations Funerals and Receptions chapel. 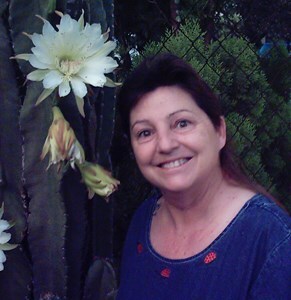 Maureen did not like cut flowers so the family is suggesting memorial donations in her memory to the SPCA or the Wounded Warriors Foundation for anyone who would like to honor her. Add your memories to the guest book of Maureen Butcher. My deepest condolences for your loss. I pray for you and your family during this time of grief and just wanted to leave you with these words of hope that has helped many look to the future with confidence. This hope is found in Isaiah 25:8,9. I remember her laughter. We always cut up and laughed at everything, including ourselves. We loved to enjoy nature while sharing all of our questions of life, and what makes people tick. I will always love sharing our time together and seeking treasure. My deepest sympathy to Jeff and family. I enjoyed working with Maureen at Bank of America. She was a lot of fun. I'll never forget when we were riding the ferris wheel at riverfest and it started to come out of the ground. Maureen will never be forgotten, rest in peace and ride Brandy up in heaven. My dearest sympathies for Jeff and family. I remember the good times when we would party for bike week and get together at our annual party. We had some fun times. You will be missed.